Lotus on Orange Featured in Sarasota Magazine - Michael A. Gilkey, Inc. The Lotus on Orange project was published in the October 2014 issue of Sarasota Magazine. The article follows in its entirety. A love for good residential architecture is in Andy Tugendhat’s genes. The iconic Villa Tugendhat, designed by modern architecture master Ludwig Mies van der Rohe in the Czech city of Brno, was commissioned by his grandparents, Grete and Fritz. Completed in 1930 and restored in 2012, the home in which Andy’s father lived until he was 5 is now a museum listed as a UNESCO World Cultural Heritage site. Tugendhat and his wife, Karin, drew on that remarkable family history, their own life experiences and a passion for environmentally responsible building to plan their handsome new modern house on South Orange Avenue. On paper, this high-tech, clean-lined home with LEED Platinum and Net Zero Energy certifications—it actually produces 7 percent more power than it uses—would seem out of place in its historic West of Trail neighborhood, where residents have always preferred Spanish-stucco, Craftsman bungalow and Mediterranean revival styles. Instead, says project designer Chris Leader of Leader Design Studio, neighbors are embracing this newcomer, actually stopping by to compliment the owners on its modern design. Leader is passionate about what he calls contextual modern architecture—creating appropriate modern designs that blend into surrounding historic neighborhoods. Coincidentally, that was the Tugendhats’ prerequisite from the beginning. Andy Tugendhat says his neighbors’ reaction to the 2,569-square-foot home has been one of the most rewarding aspects of the project. After extensive interviews, the homeowners retained Leader to design the residence, Josh Wynne of Josh Wynne Construction to manage the sustainable design aspects and build the new home, and Michael Gilkey of M.A. Gilkey Landscapes to design the outdoor spaces. This team has worked together on several other LEED Platinum homes in Sarasota. Since outdoor living and sustainability were equally important design objectives, the couple wanted a small building footprint. “After all, it’s just the two of us and a cat,” says Karin. Her insistence on a screened cage resulted in doubling the living space, with most of the 13,500-foot lot devoted to a rear courtyard with outdoor fireplace, seating areas and swimming pool. It acts as the heart of the home. “The challenge was to create a modern screen cage, and Chris and Josh looked back to the Sarasota School for the solution,” Karin says. “The roof-integrated screen enclosure definitely draws influence from how [Paul] Rudolph, [Tim] Seibert and [Ralph] Twitchell handled caged rooms, but with today’s code in mind. Back then, cages were wood; now they are custom aluminum,” explains Leader. The home has two additional courtyards, with Japanese-inspired planters organizing each space. 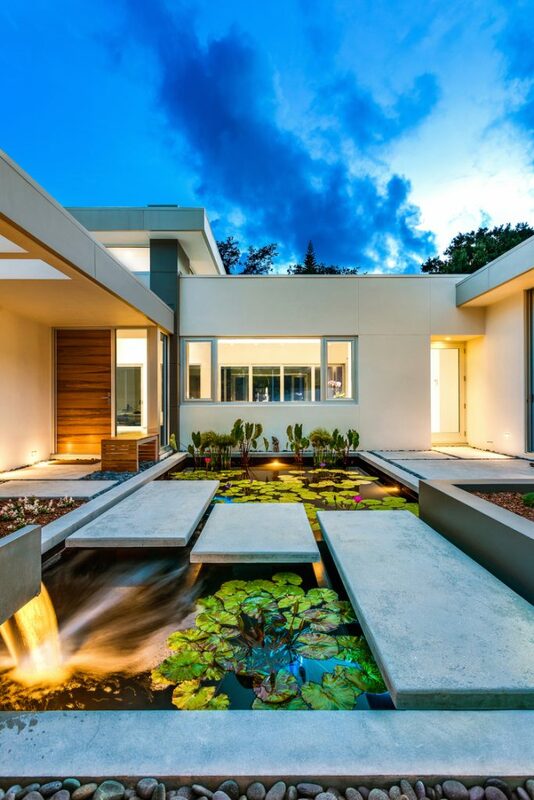 The entry court welcomes you from the street frontage with a lotus and fish pond; visitors walk across the pond’s floating concrete pads to reach the front door. A Zen-like calm is established by a water fountain that also produces white noise to drown out street noise. A wooden statue of Ganesh from India hints at the Asian art and design influences inside, including two captivating Buddha sculptures, a tapestry from an antique Chinese wedding bed and lovely Oriental carpets. “Andy traveled throughout Asia for business, and we lived in Singapore for a year before moving to Sarasota. We wanted to incorporate favorite pieces of furniture and art from our Singapore home in this design,” Karin says. Polished concrete floors are a unifying element throughout the interior living spaces and the lanai and add to the ambiance of Asian tranquility, as does a private courtyard flanking the master suite. The courtyard’s glass walls and a tropical color garden integrate seamlessly into the home’s 100-percent Florida-friendly landscape. “This home was designed with many features that inherently make it more efficient,” explains Josh Wynne, a local sustainability expert and pioneer in green building. A flush transom window design and generous amounts of glass connect every space to the outdoors and provide the passive ventilation and natural daylighting vital to LEED Platinum certification. “The impact-resistant, insulated and tinted glass is the latest in technology,” he adds. Tugendhat sees a connection between his grandparents’ Villa Tugendhat, representing the international style of modern architecture that developed in Europe in the 1920s, and its later influence on the Sarasota School of Architecture. In its day, Brno was a magnet for architectural innovators, just as Sarasota was in the 1950s. “The Sarasota School of Architecture ties back to the Bauhaus movement, which Mies’ work represents, in my view,” Andy says. Indeed, panoramic glazing was startlingly innovative in Mies’ design for the 27,986-square-foot Villa Tugendhat. Andy Tugendhat, who has visited his grandparents’ villa twice, says most people appreciate it just for its ambiance, but they don’t know about its incredible structural and mechanical engineering. “As far as I know, it was the first residential home in Europe framed in steel. It had an air-conditioning system that was ahead of its time, and two amazing living room windows [9.8 feet by 19.6 feet] that drop down into the floor below,” he recalls. With a flip of a switch, the living room became what would today be called an indoor-outdoor space. What goes around comes around.